If I may get personal for a few moments, I would like to state what I am thankful for. While I do count the stars for the simplicity of every day, there are things that I want to address. This year has been a ‘rollercoaster’ of events for me, as I have lost my beloved Chihuahua, and coping with major depression. Yet, life is going to be full of negatives as that is life, but there are also positives too. I am always going to be thankful for my family, who are a little bit weird, but I love them. I am also genuinely thankful to have the incredible opportunity and fantastic privilege to run Grounders Source. I love doing it, working on it even for a few minutes of the busy day, and seeing the final written piece/photo album/fan activity is magical. 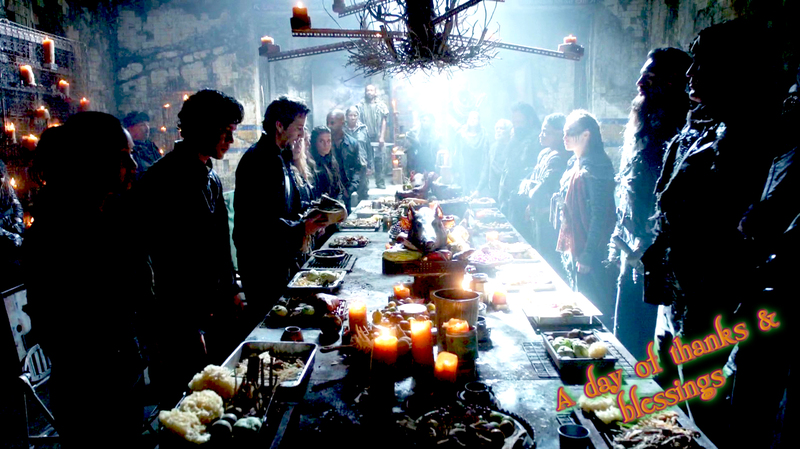 What is even more amazing is the phenomenal The 100 cast/fans/writers/crew engagements and interactions. I believe that is what is keeping the show so interesting, but daring. It touched places that normally wouldn’t be even wisped upon, and it connected on personal levels. We are not fighting for survival, we are fighting for life. With that, we do better because it renews our souls, our humane wellbeing. We would not be here if there wasn’t that light at the tunnel’s end, that speck of hope. What I am trying to say here is that without any of you, without the dedicated fandom, Grounders Source would not exist. It made my life better to be honest because it really abetted with my writing, (when you’re a writer, crafting new structures is always a plus) and I got to know some wonderful people. Many of you have been here since the beginning, and it is always a happy moment to see new faces and fans. We may not see one another physically, but we are there. Like I pointed out, I love doing it, and you all deserve it. After all, it is The 100! From the bottom of my heart, Happy Thanksgiving and well wishes! P.S: If you do not celebrate Thanksgiving, have a lovely day!